Measles was a very common disease that affected children. Measles is a virus-induced infection which can now be prevented through vaccines. The disease has potential to be fatal in some cases with most of the fatalities occurring in children below the age of five. Cough, sore throat, red and itchy skin rashes and high fever are some of the most common signs of measles. Once the measles virus enters your body, it just incubates for the first week or two and you won’t see any sign of measles during this period. After the first two weeks, the measles virus starts to affect the body. It starts off with a mild fever along with dry cough, swollen eyes and an irritation in the throat. These symptoms last for around three days. As the virus progresses, the mild illness is replaced with rash and acute illness. The rash is a combination of a number of tiny red spots (mostly flat). Since a few spots run into one another, they combine to make the skin look blotchy. The rash appears around the face first with the hairline and the ears affected the most. Within the coming days, the rash moves down to the arms as well and then progresses to the lower body. The rash’s progress is accompanied with very high fever (around 104 to 106 F). The rash does recede slowly starting from where it was present first i.e. the face and then receding slowly from the lower body. Measles virus can be spread from one person to another with the communicable period lasting eight days. The period starts from four days prior to the rash’s appearance and ends four days after the rash’s appearance. 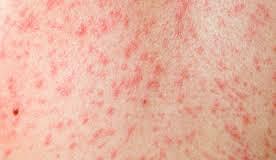 You should seek medical care if you find that you or your child has any sign of a rash that is similar to measles or if you believe you might have contracted the virus. It’s best to discuss the immunization records of your child and family with the doctor when your child starts going to school or college and when the family travels abroad. Not being vaccinated. Anyone who hasn’t already got the vaccine for measles remains much more likely to get infected by the virus. International trip. The risk of getting measles is higher if you go on an international trip to developing or third-world countries where the virus is more frequent. Deficiency of vitamin A. If your diet doesn’t have a lot of vitamin A, your chances of getting severe measles are high. Once measles is contracted, there is no way to eliminate it till it runs its course. However, there are a few useful measures which can make the disease milder. Vaccination after exposure. Individuals who haven’t received a vaccine (even infants) can be provided the vaccine for measles within 3 days of being exposed to the virus. There remains a chance that the vaccine would not allow the disease to develop even after the exposure while in case measles does develop, the vaccine would tone down its symptoms. Antibodies. The antibodies known as immune serum globulin can be given to infants, individuals with a weak immune system and pregnant women who have been exposed in the form of protein injections within six days to prevent measles from developing or to make measles symptoms milder. Fever controllers. Measles is always accompanied with a very high fever and it can be controlled and reduced with the help of medications like ibuprofen (Motrin etc. ), naproxen (Aleve etc.) and acetaminophen (Tylenol etc.). Aspirin can also be given for this purpose though they shouldn’t be given to young children. The reason is that aspirin is linked with Reye’s syndrome which is a very dangerous and fatal yet rare condition amongst children. Vitamin A. As already mentioned, people with vitamin A deficiency are more likely to contract severe measles. A large dosage of vitamin A for individuals with such a deficiency can help reduce the severity of measles symptoms. It is common practice to give patients a dosage of around 200,000 IU (international units) for around two days. Antibiotics. The doctor might even give you or your child antibiotics if the measles is accompanied with a type of bacterial infection like pneumonia. Get enough rest. Rest as much as possible and don’t indulge in any hectic activity. Drink plenty of fluids. Compensate for the liquids lost due to the high fever by drinking fruit juices, herbal tea and water as much as possible. Relieve your throat. In order to get relief from the sore throat and cough, you can utilize a humidifier. Rest your eyes. Bright light can be irritating for people suffering from measles and so, it’s best to wear sunglasses and to not watch TV or read books. Mix turmeric powder with honey or milk. Turmeric powder with milk or honey helps in faster recovery from measles as it acts as an immunity booster. Powder licorice mixed with honey. You can provide your child some relief from the dry cough and sore throat by giving him licorice in powder form along with honey. Use barley water and take a barley shower. Barley water can sooth dry throats and reduce the dry coughing that comes with measles amongst children. A barley shower also proves helpful by makingthe rashes less painful and itchy.